The most common reason for discoloration between the crown and gum line is due to what the crown is made of. There are several options for crown material, including gold, all-porcelain, and porcelain fused-to-metal. The latter combines natural-looking porcelain with a metal base which keeps the crown secure. For a front tooth, this part will usually be placed just beneath the gum — but if it becomes exposed, a dark line will appear at the base of the crown. Another factor which may cause discoloration around the crown could be gum recession. If you are brushing your teeth too aggressively, have gum disease, or are taking certain medications, you could be losing periodontal tissue that keeps the natural enamel behind the crown covered. In this case, the discolored part you see is actually the tooth beneath the crown. Finally, and less common, is decay. 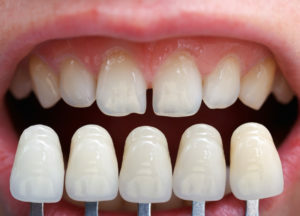 Your dental crown cannot develop cavities — but the tooth that remains beneath it can. If you fail to maintain excellent dental hygiene after receiving your new restoration and also fall behind on your routine visits to the dentist, the crown may leak, allowing acids and sugars to become trapped. This can lead to tooth decay that may go unnoticed for years, until it is visible or causes persistent pain. After you notice discoloration around your crown, your next steps will depend on what is causing the dark line. Of course, if this is just a matter of what the crown is made of in the case of porcelain fused-to-metal restorations, you can’t do much. Choosing an all-porcelain crown from the start can help to prevent this from happening later on. However, if your dark line is caused by gum recession due to aggressive tooth brushing or gum disease, it is important that you visit with your dentist. Lost periodontal tissue may need to be replaced with gum grafting to prevent extreme sensitivity and root decay. Gum disease should be managed with periodontal therapy. Getting a checkup will also help your dentist determine whether or not the dark line is the cause of decay. If it is, treating it right away will help to prevent a painful infection or tooth abscess. To conclude, seeing a dark line at the base of your dental crown isn’t necessarily an urgent situation. However, you may still want to get in touch with your dentist to determine what it is and to find out whether or not you need professional intervention. With your smile, as with all things, it is always better safe than sorry! Dr. Angelo M. Julovich is a Zionsville dentist offering comprehensive dentistry services from his practice, Trinity Dental. If you are concerned about the health of existing dental work or if you would like to schedule an appointment for superior general, restorative, or cosmetic care, you are invited to contact the office by calling 317-769-3335.